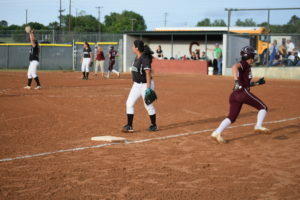 GRAPELAND – For the longest time on Tuesday, it didn’t look like the Grapeland Sandiettes and Latexo Lady Tigers would be able to take the field. Rain had settled into the area and up until about noon, the Sandiettes field was a muddy mess. Fortunately, the clouds parted, the wind began to blow and Coach Joel Barbosa was able to get the field in shape to play the game with only a 30 minute delay in the start time. 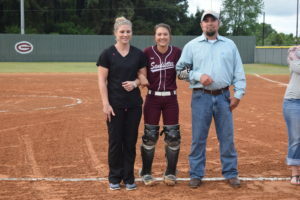 It was Senior Night in Grapeland and three young ladies were honored for their contributions to the program. 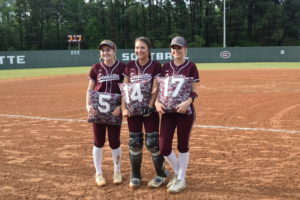 First baseman Madison Holbrook, shortstop Taylar Mullen and catcher Hailee Sheridan were presented with flowers and gifts from their teammates in an emotional pre-game cere mony. After the ceremony concluded, the two teams got down to business. 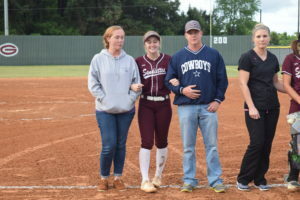 Cadie Belle Currie was in the pitchers circle for the Sandiettes and struck out the first two batters she faced before retiring her Latexo counterpart – Gracie Zalesky – on a groundout. Zalesky wasn’t as fortunate as Currie and allowed two first inning runs. After she retired Mullen to lead off the inning, Sheridan drew a walk and moved to second on an error when Currie topped a grounder that was misplayed. Cayden LeBlanc came in as a courtesy runner for Currie and chased Sheridan around the base pat hs when Holbrook lined a single into center field. Madi McCombs followed Holbrook in the batting order and laced a single to left to push LeBlanc across the plate and make the score 2-0. A passed ball moved Holbrook to third and McCombs to second, but Zalesky was able to strike out KeKe Harris and limit the first inning damage. In the second inning, Currie struck out the first batter she faced but then yielded a double to Diana Maza. With a runner now in scoring position, Currie buckled down and struck out the next two batters to end the Lady Tiger threat. The Sandiettes tacked a run onto their lead in the bottom of the second after Haley Reed walked to open the inning. She stole second and came around to score when Reagan Bishop hit a ground ball through the middle of the infield to make the score 3-0. Zalesky retired the next three batters she faced to end the inning and then Currie returned the favor as she sat the Lady Tigers down in order to close out the top of the third inning. In the bottom of the third, it appeared Zalesky might get out of the inning unscathed but a passed ball allowed Holbrook to scamper home from third to make the score 4-0.
ur more runs in the fourth inning to push their lead out to 8-0 behind a single from Mullen, a t riple from Sheridan, an error, and a single from Holbrook. Grapeland tacked on an additional run in the bottom of the fifth to bring the final score to 9-0. 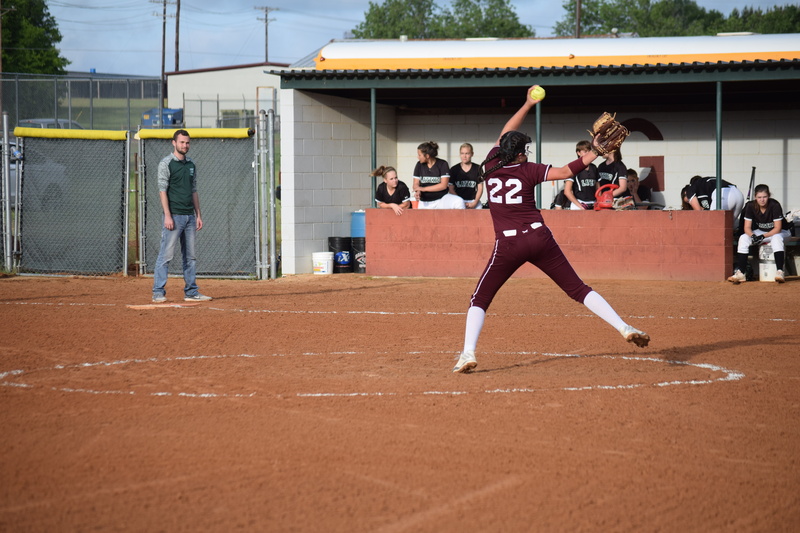 Currie was credited with the win as she pitched seven innings, gave up two hits, struck out 11 and didn’t allow a run. Zalesky took the loss after she worked six innings, gave up 13 hits, allowed nine runs (only four earned), struck out nine and walked two. At the plate, Dianna Maza was 2-3 with a double for Latexo. 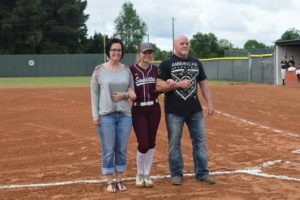 Grapeland was led by Madison Holbrook who was 3-4, with two RBI and two runs scored.